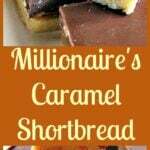 Millionaire's Caramel Shortbread - Naughty but OH SO NICE! 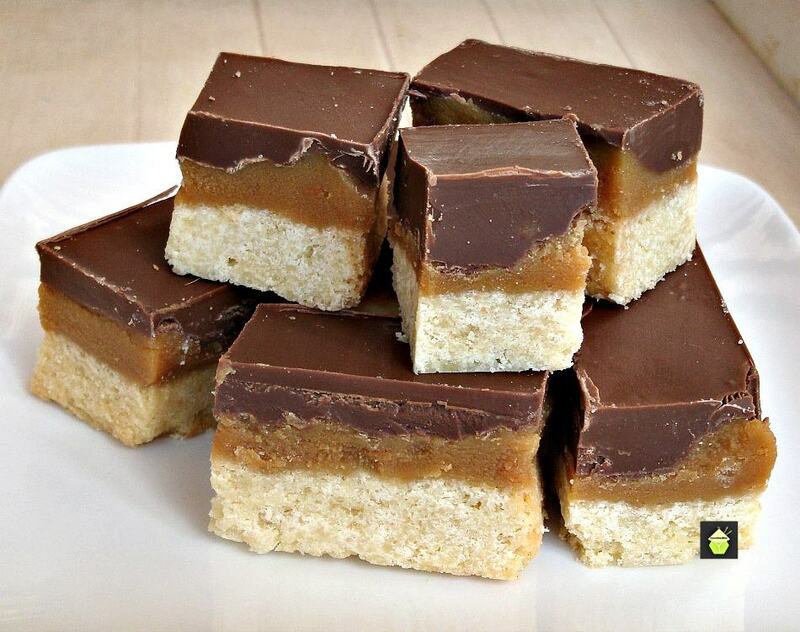 Millionaire’s Caramel Shortbread! After reading the ingredients list, and tasting this lovely ‘cookie’ ? You will soon realise why it is so much more than your average piece of shortbread. 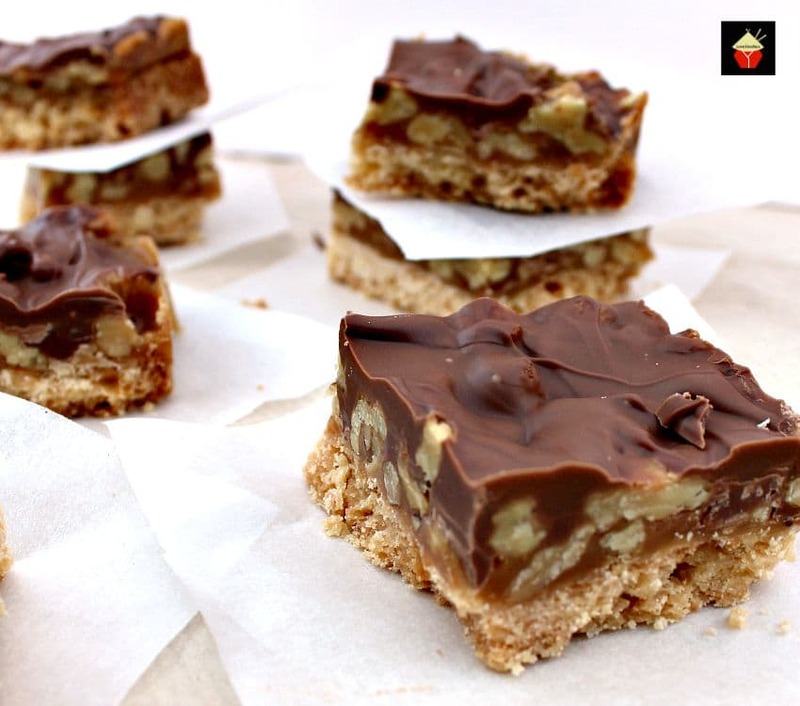 If you like shortbread, caramel and chocolate….it’s pretty much a certainty you will LOVE this Millionaire’s Caramel Shortbread! It’s an easy recipe to make, but there is some waiting involved, as we need to chill it enough to be able to cut it into pieces, but once that’s done, you can eat it as fast as you wish! This is not for the feint hearted, so anyone on a diet needs to look away now! 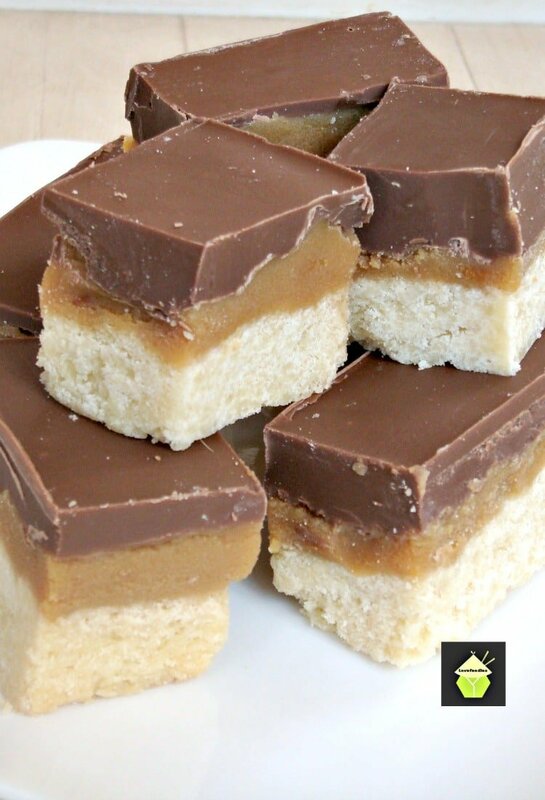 These Millionaire’s Caramel Shortbread cookies are always a huge hit over the holidays, particularly at Christmas time. So if you find yourself looking for some nice baking ideas, take a look at our variety of Cookies and Sweet Treats. There’s something for everyone so be sure to bookmark the page! 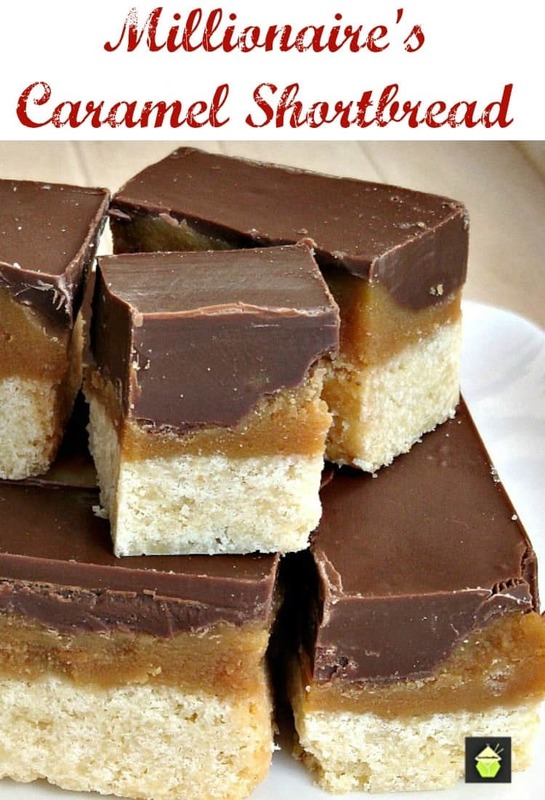 A word of warning….this Millionaire’s Caramel Shortbread really is delicious, so be sure to make enough for everyone to have seconds….and thirds! Yield: 9 or more pieces. Please note in the Ingredients listed below, I have NOT shown US CUP measures. 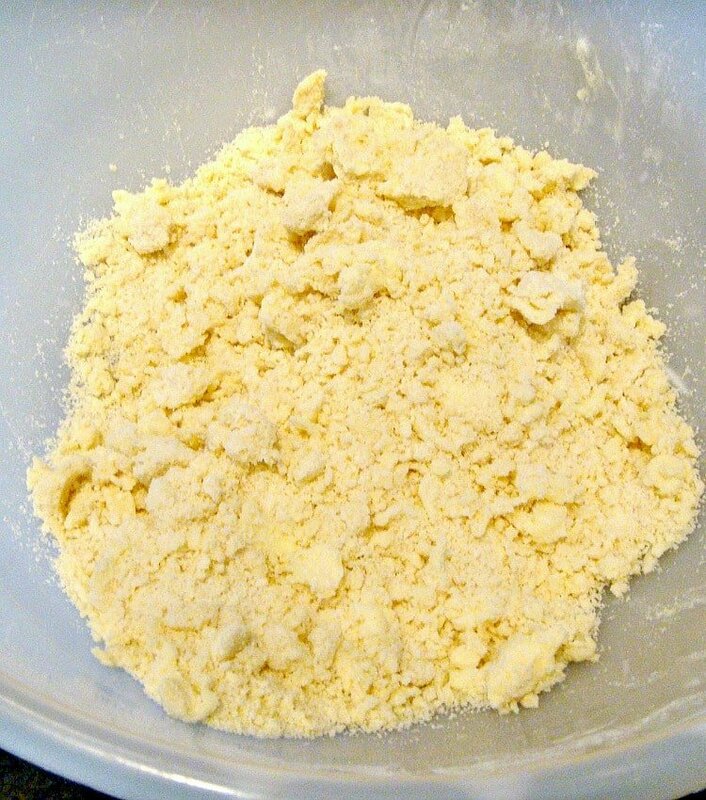 This is because the recipe calls for precise measures in order to get the correct texture and crumble for the shortbread base – which I cannot achieve from using CUP measures. The same also applies to the caramel layer measures. Where possible I always try to give CUP measures, but on this particular recipe, it really is important to use exact measures for perfect results. If possible, ask a neighbour or a friend to borrow some weighing scales for ounces or digital scales! 2. Line the cake tin with parchment. 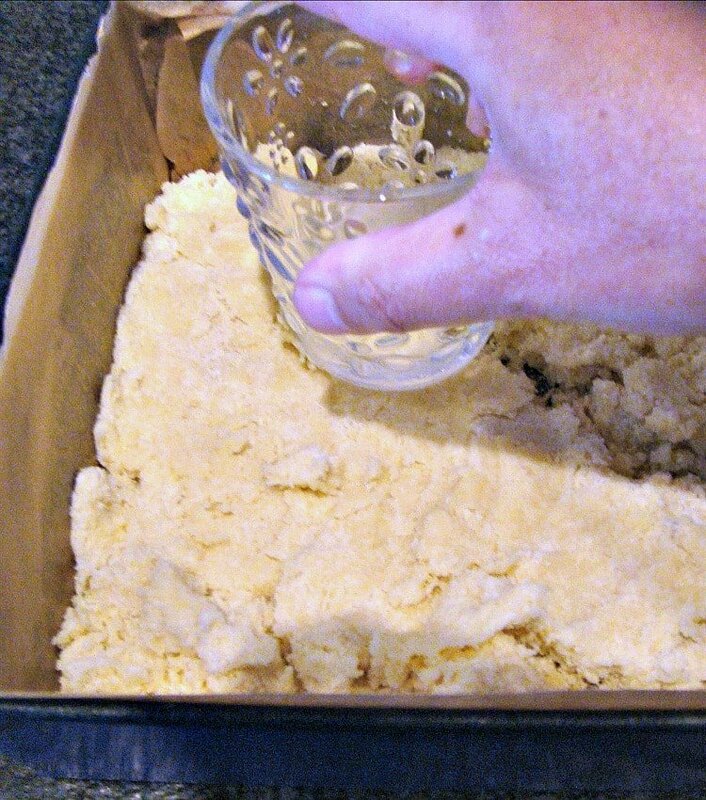 4.Using the base of a glass flatten evenly the shortbread mix all on the base of the tin. if it is too soft and sticky (from your hot hands) place it in the freezer or fridge for 10 minutes so it is more workable. 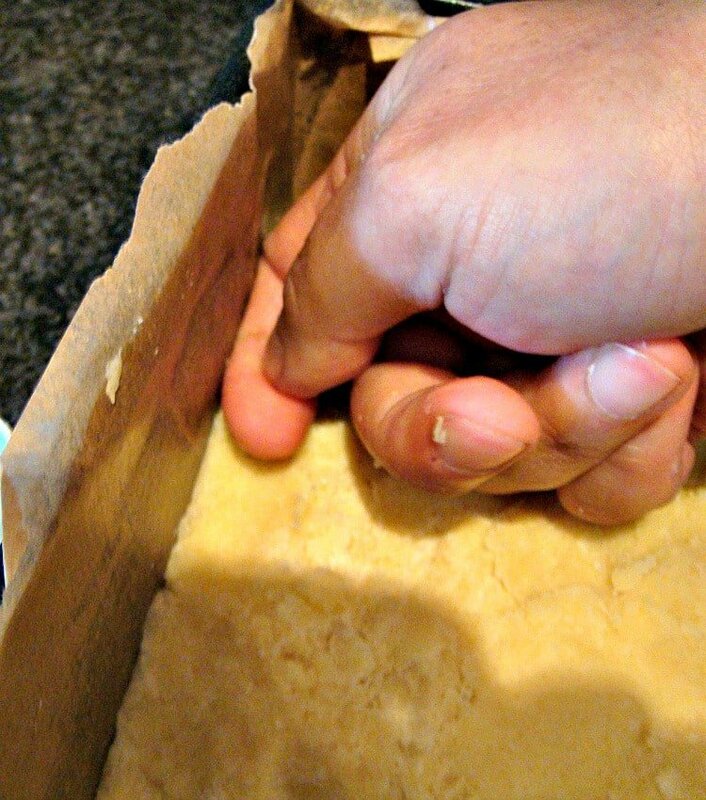 Flatten and compress evenly and go along the edges to push the dough down. (particularly the corners where your glass didn’t reach). Use a fork and prick holes all over the base. 5.When done, place in the oven and after 5 minutes, REDUCE the temperature to 150C/300F/Gas 2 for a further 35 minutes. When done, remove and allow to cool in the tin. Now we make the caramel layer. 1. 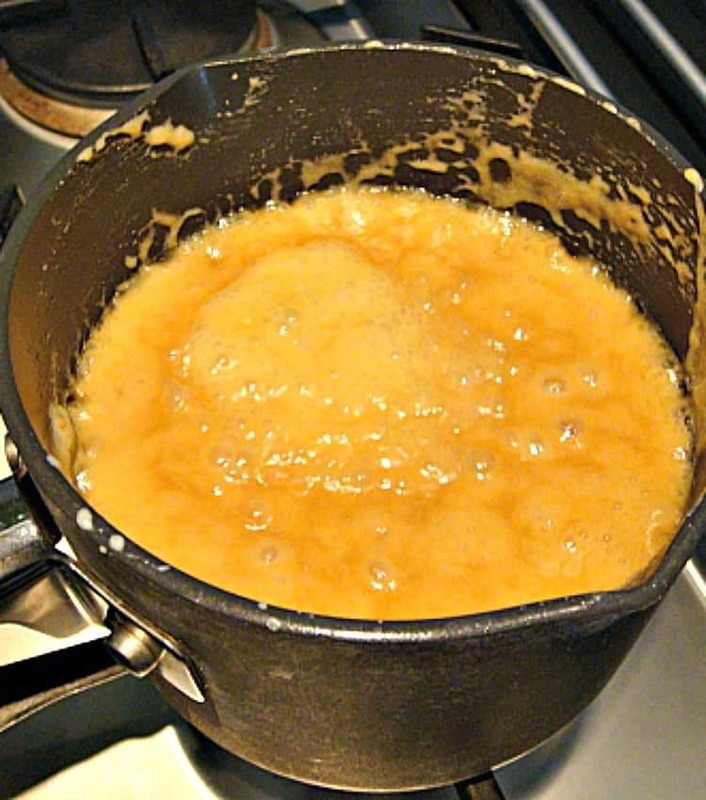 Add the condensed milk, butter, syrup and sea salt to a pan and bring to the boil. Boil for 10 minutes. Be careful of any splashes as it will be VERY hot! Stir occasionally. 1. When the caramel has set, break up your chocolate and place in a bowl over simmering water to melt it all. 2. When the chocolate has all melted, gently pour over the caramel layer and place in the fridge. Overnight is the best amount of time. If you try and cut the Millionaire’s Shortbread before it has had time to set it will be very messy! When it is time to remove the shortbread, lift it straight out of the tin by holding the parchment paper, and place on a cutting board. **** TOP TIP! When the chocolate is 2/3 set in the fridge, use a sharp knife and make score lines about 3/4 the way deep into the chocolate. This will make it easier to cut later where the score lines are and the chocolate is less likely to crack. 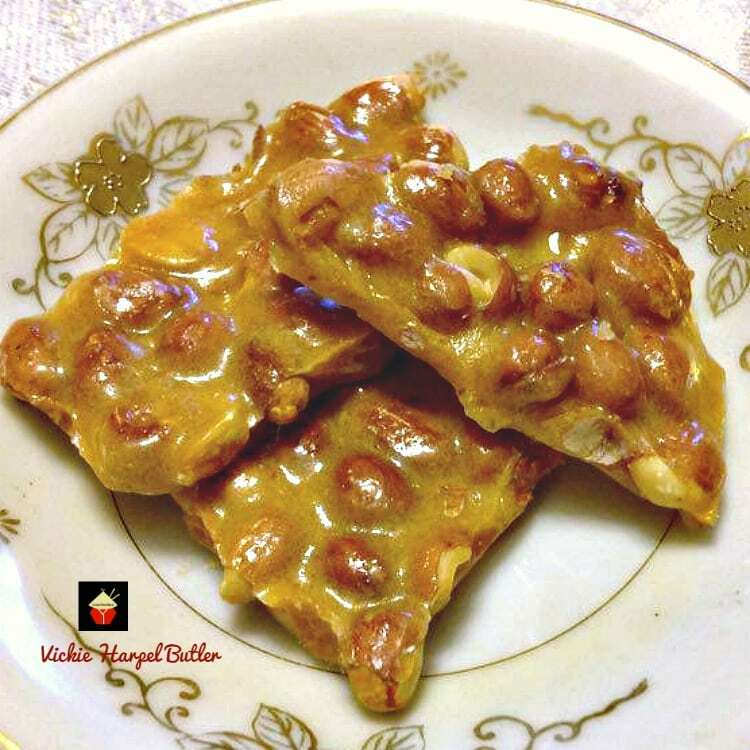 If the caramel is still a little soft when you are ready to cut, place in the freezer for 1 hour to harden, although if you chill overnight, it should be firm enough…..this tip is if you are impatient! Use a sharp knife and make straight cuts of whatever size you wish. in my photos below I made some different size cuts so you can see. Here’s a few more delicious snacks for you to enjoy! Line the cake tin with parchment as in the photo. Now we first make the shortbread base. 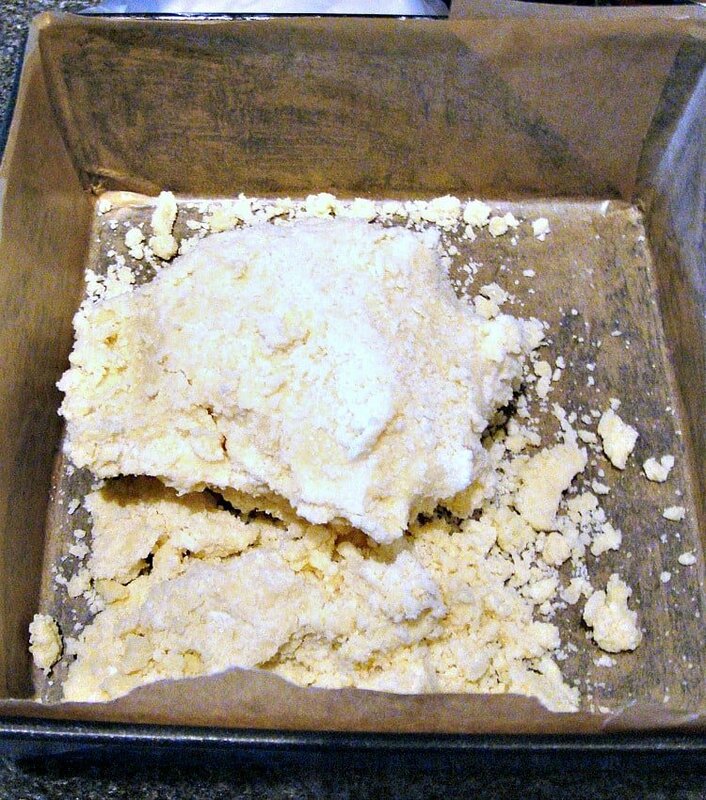 Using the base of a glass flatten evenly the shortbread mix all on the base of the tin. if it is too soft and sticky (from your hot hands) place it in the freezer or fridge for 10 minutes so it is more workable. Flatten and compress evenly and go along the edges to push the dough down. (particularly the corners where your glass didn't reach). Use a fork and prick holes all over the base. When done, place in the oven and after 5 minutes, REDUCE the temperature to 150C/300F/Gas 2 for a further 35 minutes. 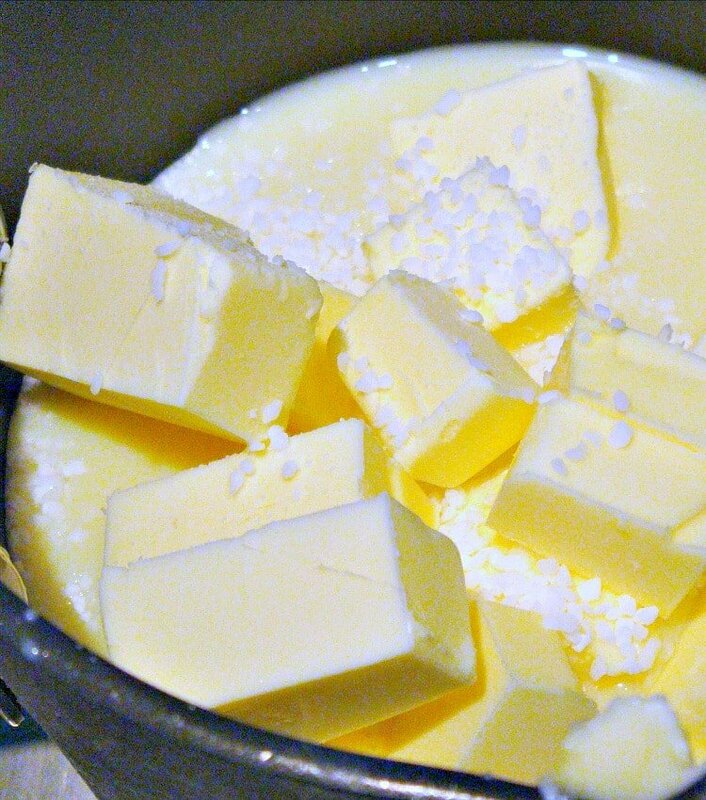 Add the condensed milk, butter, syrup and sea salt to a pan and bring to the boil. Boil for 10 minutes. Be careful of any splashes as it will be VERY hot! Stir occasionally. 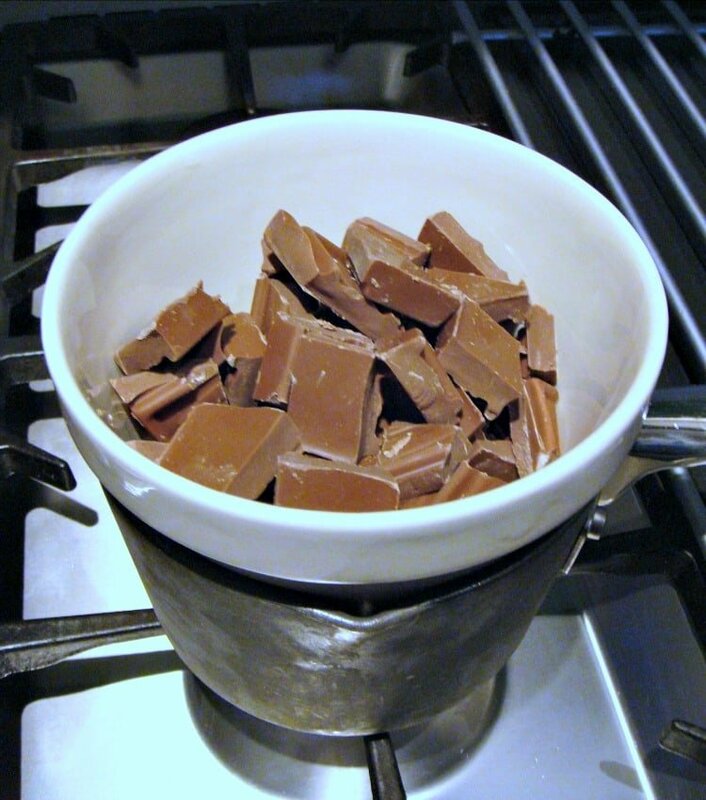 When the caramel has set, break up your chocolate and place in a bowl over simmering water to melt it all. 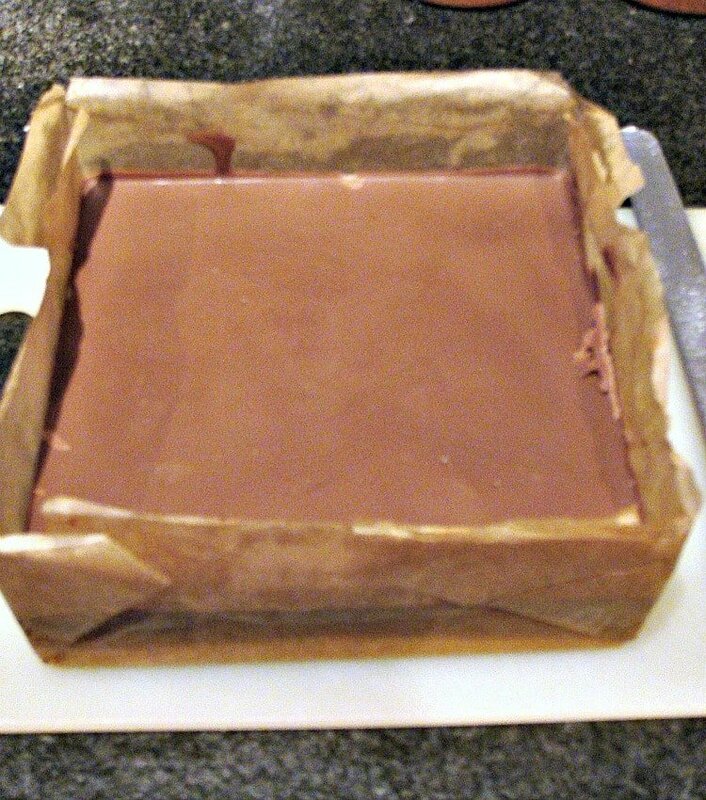 When the chocolate has all melted, gently pour over the caramel layer and place in the fridge. Overnight is the best amount of time. If you try and cut the Millionaire's Shortbread before it has had time to set it will be very messy! 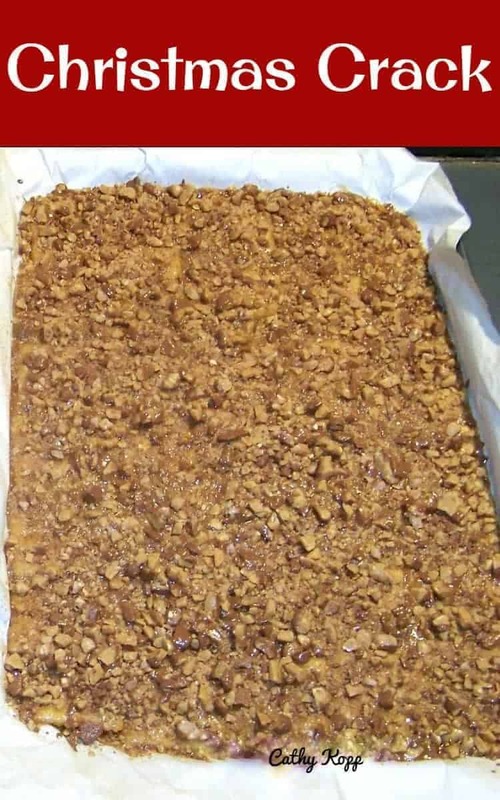 If the caramel is still a little soft when you are ready to cut, place in the freezer for 1 hour to harden, although if you chill overnight, it should be firm enough.....this tip is if you are impatient! Make a cup of tea and enjoy! feel like a millionaire for a moment! I work in a restaurant where we have petite treats on the menu and I thought this would be a great addition. However I did something wrong and want to see if you can help me figure it out before I try again. The first mistake was I had to double the recipe because we did not have that size pan only a half hotel pan size (this was not the best Idea). My trouble came with the caramel layer. 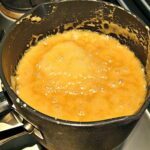 the first time the condensed milk burned while boiling, the second time ( using a distemper to keep the pan off of direct flame) it separated. The last time it stayed creamy colored and never truly set up when refrigerated. So when I cut it the chocolate cracked and the caramel oozed out the sides.. I fixed the problem by throwing it all in the food processer (minus the chocolate) re backed it till crispy let cool, added cream to the chocolate so that it was softer and called it “A Millionaires Mistake” everyone still loved it, However I still want to do this correctly as I love caramel!! Hi Sara, sounds like you’ve had fun and games with making this! I found when I first made this, I tried to cut it after only an hour or two in the fridge…big mistake as it did what you described and ooozed out the sides, and the chocolate cracked, so I immediately stopped cutting it and returned it to the fridge over night.I then cut it fine the next day as you see in the photos. The other thing you could do, to make life a bit easier if you are doing catering proportions, is when the chocloate is 2/3 set, score some portion lines in the surface so you get a clean cut for the customers. You could also, to be double sure it is really set, place in the freezer for 1 hour before cutting and use a very sharp cleaver to cut right through in one go, I know if you are making these for a restaurant you need to get all the sizes equal etc, so that is what I would suggest. 1. make score lines in the chocloate layer when nearly set. 3. Place in freezer for 1 hour before cutting..
Hope this helps, and let me know if you make them again! Thank you! I will try all this and get the right size pan before I try doubling it again. I have also invested in a digital scale which will make all my baking endeavors better I am sure! I will also make sure I try this first thing before the kitchen in super hot! Be sure to give me an update when you do Sara! Hi, trying to print out a couple of recipes from your site, but can’t seem to get the print button on the site to work, any suggestions??? Hi Julia, there is a GREEN print button at the top pf every page, in the right hand corner, just sitting on the menu bar which, when you click that will give you several options. If you still can’t find it, let me know and I’ll send you a screen shot to help. I used corn syrup in the caramel and it is soooooooooo good! Smooth and delicious. Cut the pieces tiny because they are rich! Corn syrup is just the regular clear syrup (Karo brand, etc. ).